In a world with parallel universes once ago there were four Londons but now there are only three. Dark London fell to dark magic and its doors are closed to the other worlds, all of its terrible magic locked away and mostly forgotten. Right next to Dark London stands White London, tasked against its will to keep the darkness at bay but its corrupting influence can be felt throughout. White London is unsafe, dangerous and getting darker and darker with the corrupt siblings that sit on its throne. This is Holland’s London. Next to it, Red London is a paradise in comparison: Magic is mostly used in a good way and its Monarchs sit on a bloodless throne of benevolence. Kell belongs here. Grey London is that one that forgot everything about magic. That’s our London. And Lila’s. The doors between worlds are closed but for the few – the only two left in the worlds– special magicians who can wield blood magic to open those doors. Kell is one of them. Ostensibly a traveler i.e. a messenger between Kingdoms, occasionally a smuggler of forbidden artefacts, one day he gets one thing across into Red London that he shouldn’t have. Bad Kell. What a huge mistake – and that mistake might cost him everything. A Darker Shade of Magic is a dark, grim book, full of violent, bloody magic, fantastic visuals and I loved it thoroughly because of its characters. They include a crossdressing wannabe pirate slash thief, a bisexual prince who likes to party just as much as he likes politics, a smuggler who can travel across dimensions and one dubious villain that pulled at my heart-strings so much I will be hoping for a redemption arc in the sequel somehow. Actually, it’s been a while since I found myself so completely taken with people in books and it wasn’t until reading this book that I realised how much I missed this feeling. I often read for characters and these are exactly the type of characters I tend to fall in love with. It was very early into A Darker Shade of Magic when I fell head over heels in love with them. Kell with his amazing coat of awesome that hides a yearning soul, Rhy and his shiny personality that hides a serious boy, Holland and his Dark Tortured Soul that hides…HELL, it hides HELL. And just as I starting to think – wow, this is a sausage-fest of a book – V.E. Schwab introduced a major viewpoint character and she was amazing. Lila, the crossdressing wannabe pirate who is an amazing thief and who hides nothing: she what she is and what she is a competent, joyous, snarky character who will do everything to live her life to the fullest and go places. Literally. It is interesting to note that I am fully cognisant of the fact that most of the things I described about these characters and most of what happens to them, fall squarely into familiar territory. There is nothing new about the Special Magic Boy Who Has a Secret Past or the Tortured Villain Who Might Not Be As Bad Except For The Fact That He IS Bad or the Super Selfish Snarky Thief That Helps People In The End. A Darker Shade of Magic manages to transmute all of this familiarity into something that I am able to fall back and enjoy in the way that the best fiction can do. The banter is fun, the emotions are flowing, the fight scenes left me tense because I didn’t know what would come out of them and the beautiful imagined parallel universes came to life in these pages. The latter happens in the way that the questions are asked: is Kell loved by his adoptive family or does he belong to the Royal family like a thing to be used? If everything is so good in Red London, how come the aristocracy are the only ones privileged enough? And my favourite question: is the fact that Holland has been coerced into doing horrible things enough to justify his redemption if it comes our way? Sure, there are moments that could have been expanded on, sudden expression of romantic interested were just that – sudden – and then we have the violence. I asked myself continuously, does this book revels in its violence? After all, the “darker” shade of magic is “dark” because it comes from blood magic and all the gory details that tend to accompany such a thing. Characters kill people almost remorselessly – and while I like that Lila was a whole lot more vicious than Kell, I wonder to what extent can we (should we? Must we?) call this book grimdark? I kept wondering: just because these characters are likeable and obviously have some sense of morals and ethics and are not complete bag of self-serving douchecanoes, can we hand-wave the fact that they are violent murderers and still root for them? I am not sure how to answer this question. And then…we have the angst. If I wrote fanfiction, I would be all over the unsaid things and the remarkable tension between Rhy and Holland. They had one scene together overheard by someone else and yet. The possibilities, they are many. I am invested. So my head canon for this series goes something like this: Lila takes over the four worlds, Kell finds out the truth of who he is and Holland, after a long redeeming arc, marries Rhy and they become the two kings of Red London. No one needs to kill anybody anymore or do blood magic. The end. I live happily ever after. Earlier this week, Ana and I were discussing this book. More specifically, we were discussing how much both of us loved A Darker Shade of Magic – because both of us really do love it. And the best part about reading and discussing a book together is that we often find different things to love about said book. In the case of V.E. Schwab’s latest, I found myself invested in the characters (LILA FOREVER, sorry angsty dudes), but moreso in the impressive world building, hierarchies of power, and, yes, the bloody action throughout. And, since Ana has already covered the remarkable characters – who are in fact a collection of familiar tropes, but who embody the best things about these tropes and transcend mere labels – so I will talk about what I loved the most in A Darker Shade of Magic. That is: the divided worlds, the brisk storytelling, and the bloody, delicious dark magic. These Londons are all very different from each other, each coded by Kell in different colors. Kell perceives them as: Grey London (Lila’s world, in which technology and humanity reign supreme and magic is naught but a fairy tale), Red London (his London, rich in magic and the most prosperous of the four worlds), White London (the most brutally affected world, in which magic is controlled and consumed and weakness is destroyed at all costs), and Black London (where magic reigned supreme and consumed its human hosts whole). But it gets better: from a geographical perspective, although every world has a different London called London, the rest of that world varies in size and shape, in smell and power. In Red London, for example, magic is taken from the Thames and a red sheen of magic lies over all. Red London is not a part of an analogous England, however; other than this one shared geographic feature, Kell’s world is one without an England or a France or any other familiar countries one would find in the Grey world. Furthermore, while parallel universes aren’t a new concept, I love Schwab’s take on the linear geography of each world, the importance of perception that shapes these different realms, and the power hierarchies that determine strength and weakness in each. Not only do Grey, Red, White, and Black Londons exist in parallel worlds – they also occupy a linear space in Kell’s “House” analogy. In order to get to White London, one must first travel to Red London. in order to get to Black London – should anyone dare to try to open those sealed doors – one must travel to White London. The fact that White London has been leached of its color and vibrance and magic is because of its proximity to Black London (that was); when Red London closed its doors to the other worlds, it effectively left White to starve on its own, and Grey to remain blissfully ignorant and separate of its sister realms. Details like this are awesome. I only wish there was an interdimensional/world map to show these different Londons and surrounds (maybe next book?). When Lila – who is without magic, but fast on skill, street savvy, and deadly in her resolve – travels the worlds, it is her perceptions that add to the understanding of magic. She smells Kell’s magic (floral, fresh) and Holland’s (smoke and metal and ash); she marvels at the shimmer of red and the buzz of power than runs through Red London. She is our conduit to understanding the power that others live with every day, made all the more fascinating because as someone very attuned to being disenfranchised and without any safety or power, her interpretation of magic is markedly different from protagonist Kell’s. I loved these subtle changes in mood and thought very much, moving from each character’s perspective. Too, I love the idea of magic and humanity at counter-measures in A Darker Shade of Magic – the notion that power and balance are needed in order to not just survive, but to thrive. Magic is neither inherently good or evil; it’s the examination of the power that comes with magic that is so fascinating to read (especially in a setting like White London, starved and sharp as it is). There is violence. There is blood. And there is magic that works its way through both. Ana asked: does this book revel in its violence…can we hand-wave the fact that they are violent murderers and still root for them? My response is, yes, of course we can still root for them, but no hand-waving is required. These are murderers and thieves and cutthroats and magicians of the highest and, ok, darkest order. They are hungry for power and exerting control. That doesn’t mean that we can’t root for them – even while accepting their violence. 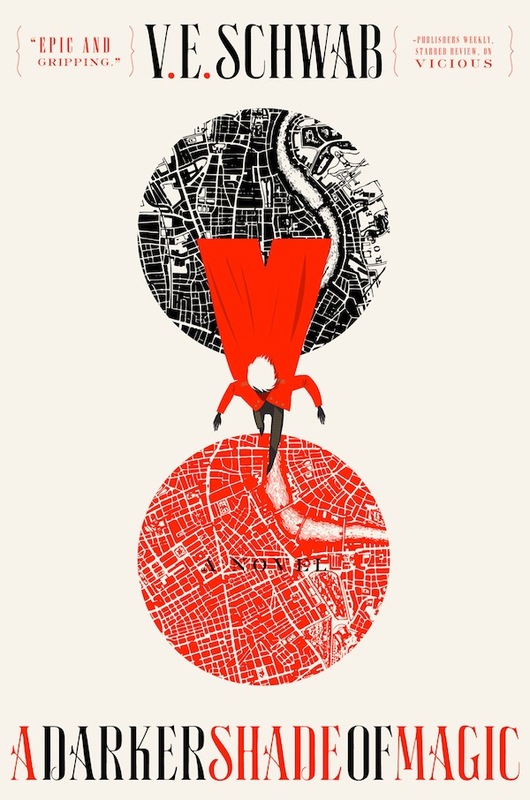 I, for one, loved every bloody second of A Darker Shade of Magic – and I cannot wait for more. This is V.E. Schwab’s finest work to date, edging out the superlative Vicious, and it is in the running for one of my favorite reads of 2015. I’ve been hearing a lot about this book recently. But everyone who I’ve heard talk about it were huge fans of the authors other work and would have bought it not knowing anything about it. So I was so happy to see not one but two objective reviews of it that also enjoyed the story. The plot line sounds intriguing and I think it has now moved up on my wish list pile. I think you explained all of the reasons I loved this book but probably a bit more coherently. There are so many things to enjoy here it’s hard to pinpoint why it all works. I am desperate for the sequel for my own reasons–so much so that I didn’t even realize I wanted a Holland redemption ARC until you mentioned it! Whats the sexual/romance content of this book? & your review indicated there’s lgbt in it?